Do you picture yourself hooking up and driving off on your own adventures? A Millard Caravan is the perfect choice for those wishing to tow, whether on a holiday or longer touring adventure. Sporting a range of styles and layouts from pop tops, off road and slide ons, every Millard offers comfort, great storage and plenty of style. Millard use 3mm Australian Blue Steel Chassis, Hot Galvanised Dipped coating the chassis inside and out. The Chassis crossbeams are complete box section ( No Z or H section steel ) for extra length. 25 – 25 Aluminium studs pop riveted at 30mm centres. This offers extra strength, lighter weight and “NO ROT”. One piece fibreglass sandwhich roof 30 mm thick, zero movement, zero joins, zero frame, protects against hail, light weight and super strong. With Australia’s best independent suspension on all vans, at no extra cost, providing a better ride, absorbing the toughest road conditions. Millard Caravans are a regional producer and have been manufacturing caravans for over 70 years, dating back to the 1940s and known as one of the original ‘Big Four’ manufacturers when founder Jim Darlington had a dream that more Australians would take to traveling the country if they could do it in comfort, safety and style. Millard Caravans are the perfect caravan for people looking for a comfortable, stylish, quality and affordable caravan; offering the best travelling experience. They are designed and manufactured to suit the needs of people who like to travel and explore. Millard have not only gained a reputation as a trusted brand, but are also known for doing things a little different to the rest. BCMC offer the Millard Caravan range including, a comprehensive range of New and Used Caravans. If you want to tour Australia in a Caravan, then look no further than our offering of Millard Caravans including the Toura, Slide On and Breakaway. Come for a visit, take a test drive and explore the possibilities! Our Toura Caravan range has many models to choose from, starting with the compact 16′ up to our larger 25′ van, and with queen or bunk bed layouts, centre, rear and front door options as well as variety of interior layouts, there is model to suit everyone, no matter what your travel needs. Our Breakaway Caravan is perfect for the adventurers wanting to see the real Australia. Built on a strong 6″ steel chassis that is hot dipped galvanised to ensure a long and trouble free life, combined with galvanised under floor sheeting to protect against stone and water damage. With the check plate front and sides plus the added benefit of battery pack and charger, large 15″ wheels and tyre and independent suspension you’ll be able to handle all conditions and have total peace of mind, wherever you travel. Millard Slide Ons are popular, ideal and an economic way of caravanning for people with a flat tray ute. Ideal for touring in safety and comfort with ease of driving, they are a fraction of the cost of caravanning, with all the benefits. There is little to no maintenance and no registration costs. They are easy to place on or remove and store, which frees your vehicle for everyday use. Slide Ons are available in shower/toilet models in several layouts and can be also customised. 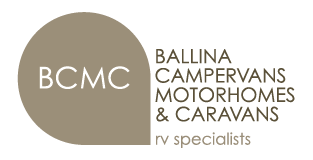 BCMC is the exclusive dealership for Millard Caravans (from Coffs Harbour to Tweed Heads), Horizon Motorhomes (nationally), Frontline Campervans (north of Newcastle) and the RV Service Centre caters for any brand RV including, campervans, caravans and motorhomes. Does your caravan need a service or are you looking to trade in? Call us on (02) 6681 1007 or click here to find out more. Millard Caravans, the name that caravanners have trusted for over 70 years.